You want your windshield to be squeaky clean. Streaking and discoloration can make driving hard and be a safety hazard. But it’s tough to find the right windshield washer fluid. You may be worried that some of the fluids are not compatible with your other window treatments or your car’s wipers. In this article, we’ll dive into the world of windshield washer fluids so that you can know which is the right pick for your car. By the time you’re done, you’ll know the tricks to keep your windshield perfectly clean. What Should You Look For When Buying Windshield Wiper Fluid? How Long Should One Treatment Of Washer Fluid Last? What Hazards Are The Most Important To Protect Against? How Do I Avoid Damaging My Windshield With Fluids? Are All Fluids Compatible With All Cars? The Aqua Charge Windshield Washer Ultra Concentrate is a cost-effective and streak-free formula which you can use to give your windshield the care that it deserves. The Aqua Charge formula isn’t the easiest windshield washing formula, but it is probably one of the best values that you can find. The cleaner is sold as a concentrate. The concentrate itself is merely dye and the cleaning chemical, so it’s very simple yet very effective. 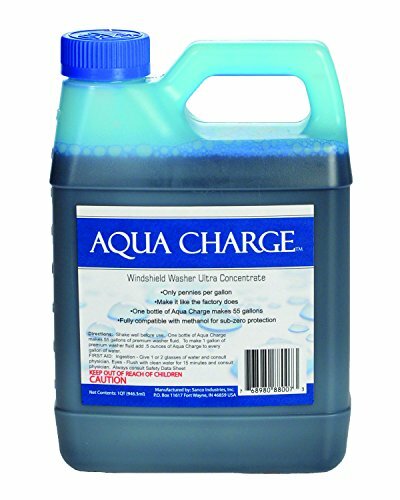 You can make up to 55 gallons of cleaning solution that is ready to use with one container of Aqua Charge. Storing your Aqua Charge might be tough if you live in a very cold area, however. The formula is supplied without any added methanol which means that it won’t catch on fire. The lack of methanol means that it can freeze at cold temperatures, though. You can mix in your methanol if you would like to preserve the Aqua Charge in a chilly garage or even outside. Adding methanol doesn’t detract from its cleaning value or shelf life. The Prestone AS657 Bug Wash Windshield Washer Fluid is a specialist fluid designed to protect your windshield from future contaminations by crushed bugs and other organic grime. 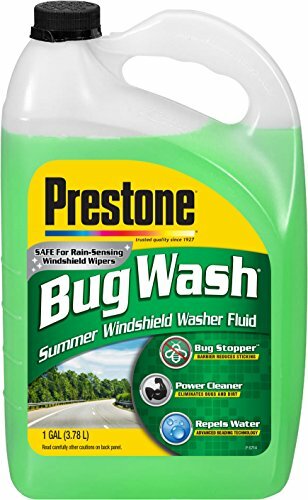 Unlike other windshield washer fluids, the Prestone is intended for use in areas lots of insects. The insects which hit the front of your car won’t exactly slide off, but they shouldn’t make as much of a mess as they would otherwise. You can use the Prestone fluid in environments where there aren’t as many bugs, but you won’t be getting the most out of its capabilities. The fluid is also effective at cleaning off some of the built-up grime, so dusty environments will be dealt with well too. Cold environments might not be this washer fluid’s strengths, however. While the fluid won’t freeze, there are other washer fluids which can deal with the effect of the cold environment on your windshield more effectively. 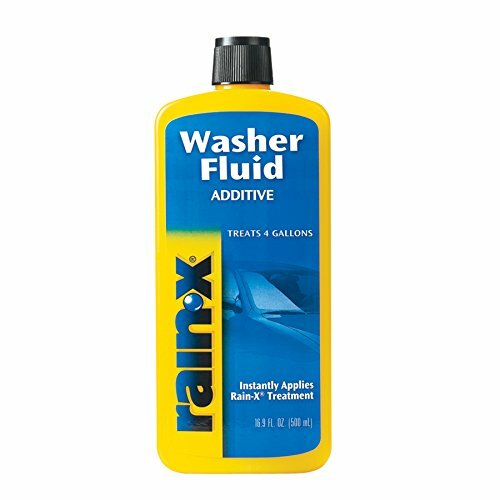 The Rain-X RX11806D Washer Fluid is a powerful supplement to your other windshield washing efforts which will supercharge your other fluids with a technological twist. Thanks to the water beading chemical treatment of the Rain-X, you’ll never need to worry about older windshield washer fluids failing to pick up the slack where it matters the most. This fluid will protect your car against all manner of hazards. That includes insects, grime, snow, salt, and everything else that your car will encounter on the road. You’ll find that your windshield is easier to look through and easier to keep clean than before. The only real downside of this washer fluid is that you shouldn’t use it alone. The fluid is designed to be mixed into up to four gallons of another washer fluid. The other fluid that you choose is up to you. The RainX RX68806 Rain-X Bug Remover is the Rain-X offering which can stand alone on your windshield in the face of heavy insect presence. 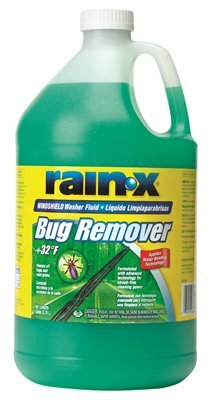 As another windshield washing fluid that is intended for heavy-duty anti-insect usage, the Rain-X bug remover lives up to its name. No matter the rural road that you are driving down, this windshield washer fluid will help your viewport to stay squeaky clean. The fluid is very easy to apply, which is great because you may need to be applying a lot of it during the heavy bug season. This isn’t a fault of the fluid itself, but rather a consequence of the number of bugs which can get stuck to your windshield. Like other insect-oriented fluids, this fluid is probably not the strongest when it comes to protecting your car from winter hazards. Bugs come out in the summer, and they aren’t necessarily very heavy in grime or other moistures. Nonetheless, this fluid is a respectable choice if you plan on spending a lot of time in the hot environments where bugs dwell. 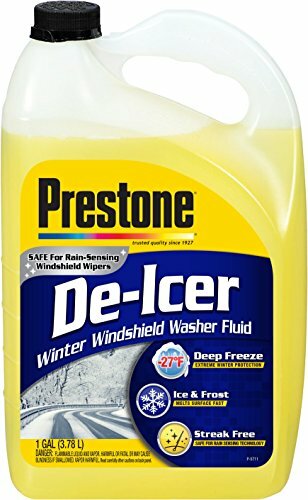 The Prestone AS250 De-Icer Windshield Washer Fluid is the optimal choice for people who expect to go up against the extreme cold and flash freezing temperatures while they are driving. The AS250 is the premium anti-freeze and windshield wiper fluid combination product. With the help of this fluid, you will never need to worry about dangerous ice fluvials forming on your windshield. This is especially important to avoid if you live in an area which often crosses the boundary between subzero temperatures and warmer temperatures in the day. If you leave your car unattended with ice fluvials on the windshield, it may end up cracking the windshield. That’s what makes this fluid so impressive. By treating your windows with the AS250, you can ensure that ice fluvials don’t form in the first place. Your windshields will last much longer as a result. As though it weren’t enough, the fluid can also break up existing fluvials which may have accumulated while you weren’t using the car. You can dispense with the dangerous scraping and smacking of tough ice deposits, which will prevent a lot of wear and tear. There are a few main features which you should care about when you are looking to purchase a windshield wiper fluid. First, the fluid should deal with the hazards you are the most likely to face. Simply put, you don’t need to purchase an anti-freeze windshield washer fluid if you live in a desert. Likewise, don’t buy a washer fluid that is effective against bugs when you don’t live in an area where bugs are an issue. There are a few generalist windshield washer fluids which can be used in any environment, but typically it is better to use the fluid that is adapted for the season and the environment that you will use your car in the most frequently. Next, you should get a washer fluid which provides you with a lot of capacity. This means that the washer fluid will probably be a concentrate. You can buy undiluted washer fluids, but you will need to purchase these fluids a lot more frequently than you would need to purchase a concentrate. The added hassle of diluting the concentrate yourself with water is minimal in most cases. Imagine the difference between adding a quart of water to a washer fluid versus having to go to the store. You will usually be better served by simply purchasing a concentrate. Furthermore, your windshield washer fluid should not need to be re-applied to your windshield every time you drive in most cases. Though there are exceptions like de-icing fluids, for the most part you will get more mileage out of your fluid if you only apply it every once in a while. Persistent fluids are preferable to fluids which wash away instantly. Fluids which retain a presence on your windshield to guard against future hazards are the norm, so fluids which don’t offer any kind of additional treatment are not worth your time. You shouldn’t worry about these persistent treatments damaging your windshield, nor should you worry about them caking or streaking on your windshield. It bears mentioning that no windshield washer fluid should leave streaking of any kind on your car. The fluids which leave streaking are sub-par, and it’s easy enough to find another fluid which won’t share the same problems. Finally, you should purchase a windshield washer fluid that has a pleasant scent. Unlike with car soaps, there isn’t really any standard scent of windshield washer fluids. Some fluids are citrus scented whereas others are a more traditional soapy smell. You shouldn’t be getting strong odors from your windshield washer fluid while you are on the inside of your car, but it is highly likely that you will catch a whiff of it here or there. Most washer fluids smell just fine, but certain anti-bug and antifreeze fluids can be a bit off putting. There are acceptably smelling examples of washer fluid to be found, but it’s a matter of personal preference. There isn’t exactly a massive selection to choose from, however, so you should be in the mindset of settling for an acceptable scent rather than finding one that actively smells good. The answer is that it depends on the conditions that you are driving in. Conditions with a lot of dust will require more frequent treatment if you want to keep your windshield clean. On the other hand, dust buildup is not going to damage the windshield in the short term, so it is okay to leave dust on your windshield for a while. The same is not true of other hazards like ice. Ice buildup must be removed as quickly as possible, so you will use more fluid to deal with them. For hazards like bugs, there isn’t really any chance of damage, but they are very unsightly. You will probably go through units of anti-freeze and anti-bug windshield washer fluid faster than you will other kinds. Ice is the most important road hazard to protect your windshield against. Ice can cause long-term damage to the windshield by creating microscopic cracks which can later be exploited by mechanical trauma to break your windshield. Furthermore, normal methods of removing ice are dangerous for your car, too. You can’t safely remove ice using a scraper when it becomes very strongly adhered. That means you are left to use your windshield wiper fluid preventatively. Most other hazards are largely cosmetic. Nonetheless, of the cosmetic hazards, dead bugs on your windshield are undeniably the worst. Aside from being gross, dead bugs eventually take on an unpleasant smell which may persist after they are wiped away. You shouldn’t need to worry about damaging your windshield with any wiper fluids. Wiper fluids are designed to be applied to the windshield very frequently, and they aren’t intended to be washed off after application. Make sure that you dilute your washer fluids according to the instructions and you will be fine. For the most part, yes. There are some older cars which may not have a spray pump that is strong enough to properly disperse the more viscous windshield washer fluids. Nearly all cars constructed in the last 20 years do not have this drawback. For older cars, you should probably look up the proper washer fluid to use. Otherwise, you are free to use whichever washer fluid you have.